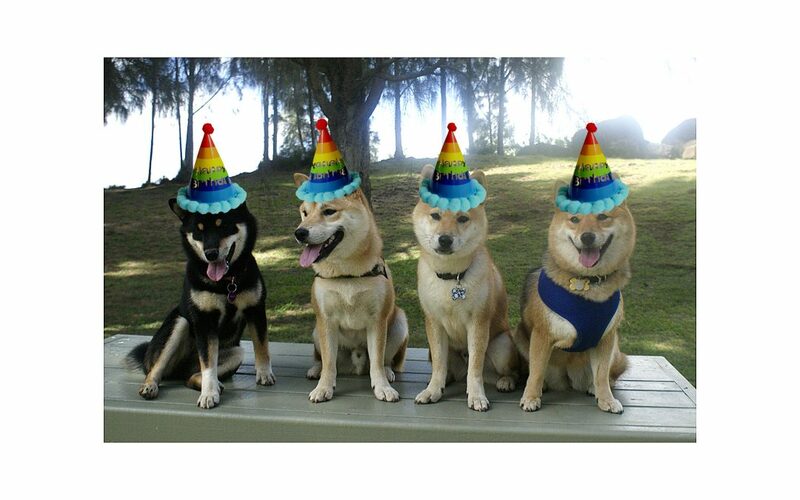 There's a saying that every dog has their day, and what funner way to celebrate this day than a Shiba Inu birthday party bonanaza! From Shiba Inu pup to senior doge, every Shiba Inu, sometimes secretly, loves attention. Especially if that attention involves food. So to ensure that your Shibe / Shibes to have a heckin' good time, you're going to have to pull out all the stops and plan just like you would for a human birthday bash! That's why we decided to create this guide for throwing the ultimate Shiba Inu birthday party! The 'initial planning phase' is where you begin to eek out the main details of a birthday / adoption anniversary for your Shiba Inu. 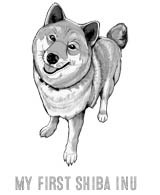 Is your Shiba Inu a pedigree pup that came with certificates and papers or an adopted dog from the local shelter? Usually, if you have yourself a pedigree Shiba Inu that you received from a qualified breeder, you'll have the paperwork that indicates the exact date when your pup was born. Most often, it's the day the pup was adopted, often coined as the "gotcha" day. Once you have figured out your doggo's birthday, take a look at the calendar. Does the birthday fall on a weekday? Can you move it to the weekend? Mark the calendar once you have chosen the perfect day to celebrate. Where the party is going to be held is one of the most essential points. Do you have a spacious enough backyard? Is there shade? How will the weather be? How many doggos will fit inside your home? Is your household prepared for that many dogs? What about renting an outdoor or indoor space nearby? Can you go to Petco, Petsmart, a farm or a doggy daycare? If where you live allows for dogs to run freely (and safely) on the beach, you could consider having a beach party. Other places that have fencing or allow for dogs to roam without a leash can also be ideal. However, do keep in mind that some dogs can't be let off a leash if there is no enclosure, some dogs aren't properly housebroken, and some won't listen to commands. You need a space that accommodates all doggos who receive an invitation. This means that if all your friends have dogs no bigger than a Shiba Inu, you won't need the same amount of space as someone who is bringing two Great Pyrenees dogs along to the party. Before sending out invitations, make sure to take the time to consider who want to invite to your Shiba's special day. It's best to invite friends and dogs are already on friendly terms with your Shiba. Don't invite any dogs that have any history of aggression or hyperactivity. It's also fine if you decide to make your Shiba Inu the only dogs star of the party. While the party might not be as lively without other dogs, it'll also be a lot less work and planning on your part. Before making any major decisions on decorating themes and food - determine your budget first. Some of the bigger potential expenses of parties are location / equipment rental and food. Once you have a rough estimate of how many people may be coming and where you are going to hold the party, you can then figure out exactly how much money you need to set aside. DIY the favors and decorations -- this can include free templates and printables from online or simply making your own designs. Get creative! Make the party potluck or bring-your-own-plate to reduce how much you spend on food (also a great option for party goers that have stomach problems or food allergies). Get volunteers and close friends to help out with the setup, clean up and breakdown. Because no one should have to pick up all that poo alone. Ask a friend with a decent camera to take pictures instead of hiring a photographer. Use your own home and yard instead of renting a space. One of the most fun aspects of any party is getting to choose the theme! Shiba Inus are so trendy and stylish that there should be no shortage of theme ideas. From cutesy Kawaii to humorous Doge memes - choose something that best appeals to your design senses. Don't worry about the theme being cheesy—your doggo will be happy with whatever theme you choose. It's the attention (and food) that matters! But it would be a good idea to match the theme to your Shiba Inu's personality. Cosplay party -- if your Shiba Inu was born in October, why not have a Halloween-themed birthday party where everyone invited gets to dress up? People can dress as dogs, and the doggos can be human characters. Talk about role playing! Beach party – perfect for places with loads of sand. Include inflatable palm trees (just be aware they might be used for marking), and bathing suit pieces for dogs to wear. Unicorn party – make unicorn hats for all doggos and humans to wear; include rainbow colored puppy chow (Chex mix), and unicorn poo (dog-friendly icing) as a tasty frozen treat for everyone to enjoy. Dinosaur party – kids and dogs alike will be super excited about a party that involves digging up different kinds of bones and dinosaur eggs. Circus party – you have the animals, so why not make a big top inspired area with obstacle courses and tricks for treats? Have guests dress up as strong men, bearded ladies, lions, tigers, and bears (oh my). Superhero party – because every good boy/girl deserves to wear a cape. Want to go completely off-the-wall? Hold a cat-themed birthday party for your dog. Imagine! Thought, we have to admit, the idea of a fox or cat themed party for a Shiba Inu would be absolutely magical! Choosing a theme is fun, but it is the decorations that bring the ultimate Shiba Inu party to life. You can go as over-the-top or as simplistic as you want. If you love decorating, then your Shibe's party shouldn't be any different that setting up for the holidays. Decorations, depending on the theme, can be store bought or homemade. The latter may be cheaper in the long run, especially if you are handy with arts and crafts projects and have people who can help! 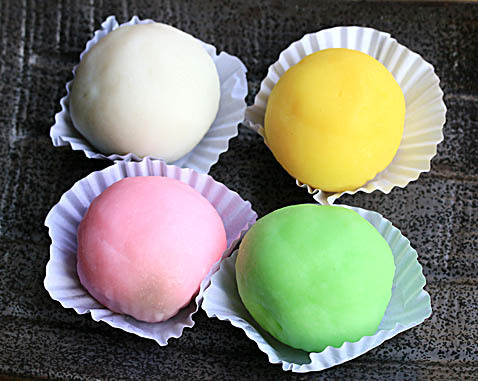 Oriental Trading – you can find a number of balloons, paper supplies, centerpieces, ceiling decorations, and other elements for a decent price. Party City – a bit more expensive, but you can find some themed items that may not be available elsewhere. Also, Party City usually has free shipping codes. Michaels – not the most budget-friendly for party decoration shopping. However, if you need specifics or supplies for DIY, Michaels is great. Amazon – when you need a world of party decoration ideas and suppliers all in one place, no website is better than Amazon. Other locations where party décor can be purchased include local dollar stores, hardware stores (for DIY projects), and websites with online templates (for example, Catch My Party printables). What about favors? People are easy when it comes to favors—just give them something they can use or put on a shelf as a reminder of the fun they had. Dogs are kind of like toddlers. In other words, you should include some edible snacks, chews, and appropriate toys. Individual bags can be made up, but sometimes have a community “favor-pool” might be the best way for all dogs to share from and enjoy. Ideas for a toy box include tennis balls, plush toys, Kong chew toys, and similar. Favor bags can also include necessities, such as poop bags, hand sanitizer (for the picker-upper), dog-friendly wipes for face and bum (or to make the stinky doggo smell better), and dog-friendly breath mints. Of course, you don't want to forget the humans in attendance either! Include cookies for both dog and dog-parent to enjoy, maybe an accessory, and something that says, “Thanks for coming today!” You can get creative here, but one way to make deciding on the items easier is to go along with the theme of the party. In the age of digital media, mailing actual invitations might not be necessary (though it is still a really cute idea). 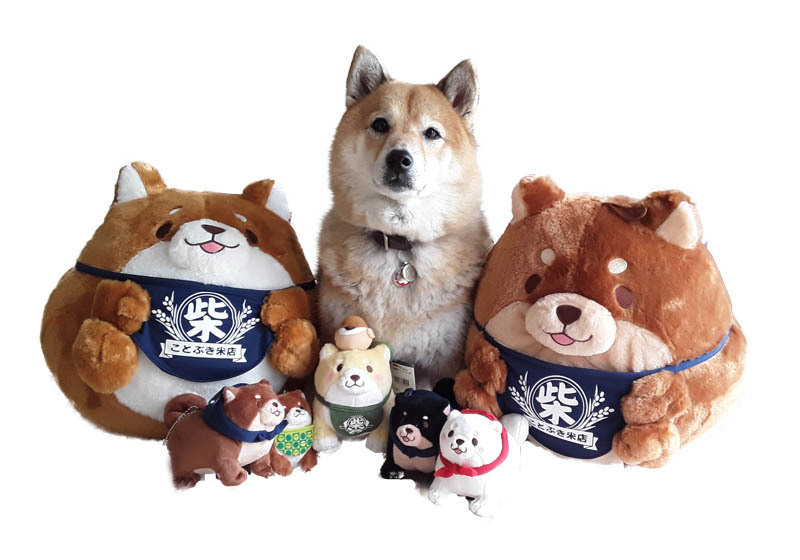 You can decide how you want to invite people to your Shiba Inu's birthday party, whether that is via email, snail mail, opening a Facebook event page, or a blend of all three. E-invites are a great option for people whose real address is unknown to you, or if you are trying to be eco-friendly and save trees. Real invites are wonderful if you want to send a small party favor, such as a home-baked dog treat or accessory—think clip-on collar bow-tie or customizable party hat—that invited doggos and humans have to wear to get in. If you need some party invitation ideas, check out the local stationary store, Etsy, or downloadable templates. You can also create your own for free with programs like Canva or Adobe Spark. RSVP information – include your phone number and email address. Ask that all pet parents use a traditional leash instead of retractable leashes, which can be a hazard in spaces with multiple dogs running around. Include a form for pet parents to fill out pertaining to food allergies or sensitivities they or their fur-child might have. For most dogs, and humans, food is the absolute best part of any party. To produce an awesome Shiba Inu birthday party, be sure to make the food of the party scrumptious and of course, safe. Dogs are easier to feed than humans most of the time. The menu can easily be decided once you have a list of food intolerances from the pet parents that RSVP'd on time. Whether you decide to go from scratch or purchase a cake from a bakery, there are a number of birthday cakes out there that are ideal for your Shiba Inu. There are also special birthday cake dry mixes available online for purchase, but you want to make sure that the items you need will be shipped to you before the birthday party! 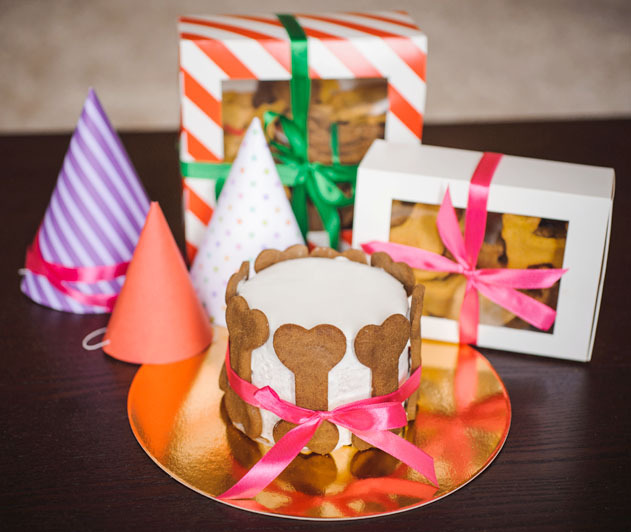 Spoiled Dog Cake Recipe by Love From The Oven: This delicious cake is packed with a bunch of delectable ingredients like Greek yogurt, peanut butter, applesauce, and pumpkin, all of which highly digestible for dogs. The best part is that all the ingredients make it friendly for humans too...unless you decide to top it with kibble or dog bones, that is. 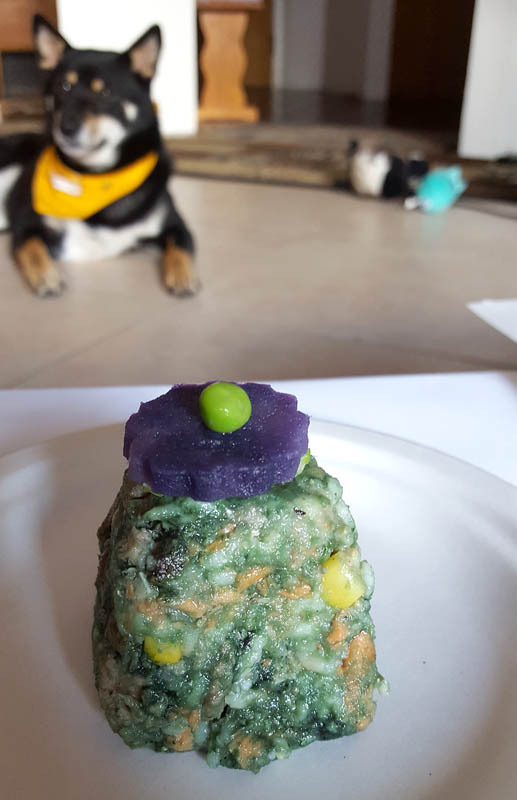 Peanut Butter Delight Birthday Cake by Moms & Munchkins: What is better than carrots and bananas for your spoiled fur-baby? A cake made out of them, that is. The frosting is made out of cream cheese and baby food, making it save for sensitive stomachs. Again, the ingredients used make this cake perfect for dog and pet parent to share. Banana and Carob Cake by Baked By Joanna: Can we take a moment to drool over this dog-friendly masterpiece? Not only does the finished product look like something fresh from a professional baker, but the whole process is surprisingly uncomplicated. And no, you don't have to worry about those carob chips. Carob is a dog-friendly alternative to chocolate that is packed with health benefits! Grain-Free Cake by A Cozy Kitchen: Have a doggo (or even human guests, for that matter) who have to avoid wheat and other grains? Then this recipe is perfect. There is apple, eggs, yogurt, honey, and chickpea flour to make a fluffy, tasty alternative that everyone can enjoy. Leave the more intensive chews, like bully sticks and bones, for the favor bags. Biscuits, jerky, and training treats are the perfect nibbles to have on hand. Other options include pet-friendly human food options, such as air-popped popcorn without salt, sliced apples (and other pet-friendly fruits), sliced hot dogs or bite-sized burgers, and yogurt. Izzy's apple-cheddar dog biscuits by Martha Stewart. For us humans, typical finger foods may be a good idea since we will likely be busy ensuring our dogs are behaving and having a good time. Chips and dip, pizza, grilled sandwiches (burgers, hot dogs, sausages), fruit bowls, and crackers and cheese are all great options. Human parties and dog parties can both be incredibly fun when you choose the correct activities. Granted, some Shiba Inus are not exceptionally playful, but try finding an activity to entice and bring out their "inner puppy". 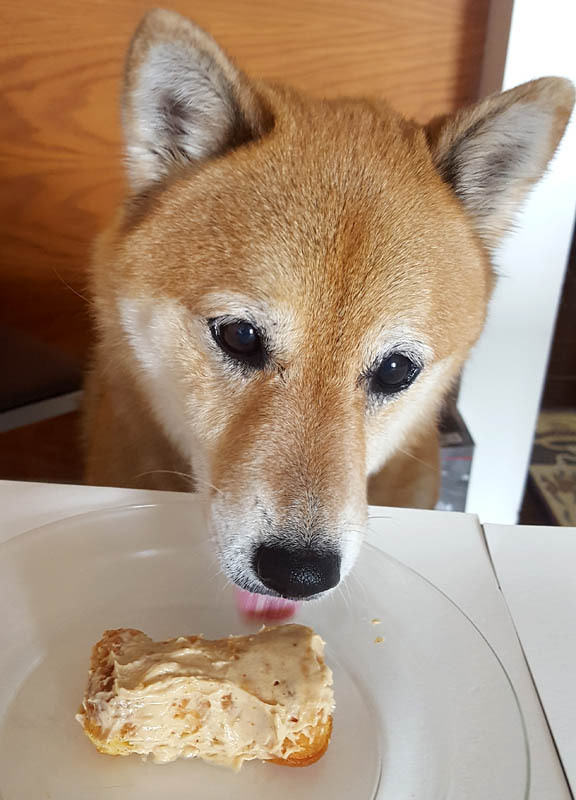 Now this is an activity that all Shiba Inus should enjoy participating in - tearing and demolishing something to get something yummy in return! This includes both human and doggo contestants. Some dogs will sing along with their owner. Others might give hilarious reactions and looks as they get serenaded. Either way, it is sure to have people howling. Judges award points according to overall performance, song quality, and how the dog reacted to the overall performance. One way to capture memories is to have a photo booth set up where people and dogs can enter to have group pictures taken. You can choose what type of camera you use, but an instant Polaroid camera will be an excellent way to make a progressive activity, where people then decorate the photographs with markers and stickers. You can also create a digital photo book to share with everyone once the party is over. Here is a fun way to make thematic elements also work for you as part of a game. You can having tubing, barriers, pools, and other things that can work as obstacles for dogs to run through and around. Set them up in a way that mimics an agility course and see if people can get their dogs to follow them through it. The group that finishes the fastest, clearing all obstacles in a satisfactory way, is the winner. Just like “Simon Says,” this dog-friendly alternative is going to make certain pets look like superstars. If everyone has a dog that has attended basic or obedience training, then Snoopy Says is sure to be a hit. Make the game more challenging as it progresses, like instead of just saying “sit,” you try to get dogs to sit on chairs, for example. Unless the theme already has pets dressing up in party hats and other items, you can host a costume contest for the best dressed party-goer. Of course, you are going to want to pull out all the stops with your doggo, too. It will be an excellent time for both pets and their humans alike. Find-It and Fetch games are a fun way of tuckering out energetic pups. You can create a list of items that pups and their humans have to seek out, or do something similar to an Easter Egg Hunt but with dog-friendly alternatives. Dogs don't need any special encouragement for this if every egg has a special treat hidden inside! Dogs love food, that's no surprise. So why not have some fun and see whose doggo has the biggest stomach? You can either whip up the treats or have someone else (like a doggy bakery) help out. The messier the better, so pet parents can enjoy seeing their fur-children covered in colored icing. Just make sure keeps a hold of their dog. While every human and dog will probably know one another beforehand, there are some precautions you need to think about. Disagreements and misunderstandings happen between dogs all the time. You're going to need to make sure all dogs are supervised to ensure that no fights break out, especially if there are younger children also at the party. Have information on every single doggo that has been invited, including up-to-date shot information, assurance they are flea and tick free, are spayed/neutered, and whether or not they have attended obedience school. Also keep in mind that while your doggo might be completely fine with other animals, such as cats, birds, and farm animals, other dogs won’t always be as well behaved. If you have other animals around, consider moving them to someplace out of sight or having other pet parents sign off on whether their dog is fine with other animals. Set up a meet-and-greet area so that all dogs can become acquainted prior to being released into the space. You want to ensure that everyone is going to get along. To avoid having poo tracked around, set up a designated doggy bathroom spot -- especially if you are indoors. Purchase a first aid kit, because accidents can happen anytime, anywhere. Make sure to include supplies fit for both human and animal. Refrain from buying small treats and toys that can become a choking hazard, especially for bigger dog breeds. Set up spaces where dogs and humans can be separated to ensure there are no mishaps with food, drink, and other goods. Have a well-stocked supply of poop bags, clean up supplies, spare leashes, and towels. Set up a shaded space if the location you're using doesn't have natural shade. Also follow the weather forecast closely if you are holding the birthday party outside. Obviously, every fur-child deserves to be honored on anniversary of the day they were born, so what are you waiting for? There are a number of themes, decorations, recipes, and activities that every pup and parent can enjoy on the day of your Shiba Inu's birthday party. Be sure to follow the advice and tips from this guide, and the party will go off without a hitch. Happy Birthday to your doggo!